Hi fantastic turnout..well done to everyone who braved the weather!! No pure breds came forward as the weather was awful and most had gone home..
cool! lovely picture btw pam well done! are you going to the south east region group show? Hi Rani, You got there before me! It was indeed AARRAGON'S first show, and a fabulous win. Weldone Reimore Arabians for breeding such a stunning colt. 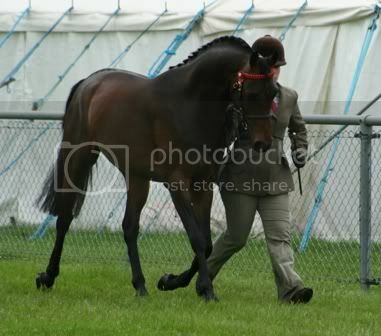 a correction to the yearling colt class at South of England. The winner of this class was Aarragon and not Pendragon. Thank you for all the results Sazzlepants. I was extremely proud of my little boy - Murraybrook Moriarty - getting 2nd in the pba 2/3 year olds in very good company. He also won at Surry County on Monday although the numbers there were very low. He only did 1 show last year and these were the first big shows he's done this year as a 3 year old colt, since hitting puberty!! There will always be some judges that dont like him as he is over 80% arab but so far he's doing well. Must say we suspected that Ianthe was going to win, she was absolutely fabulous, so we left before it finished due to being soaked and freezing. I don't know how all the riders and horses managed, it was vile weather!! Let's hope this show get its "C" status back for next year. It's one of the few County shows that bother to affiliate to ECAHO.